La Esmera snacks are characterized mainly by delicious taste, the best quality, variety of shapes and flavors - everyone will find something suitable for themselves! What is more, all the above features are enclosed in unique, eye-catching packages. It is worth highlightning that all of these products are gluten-free and fried on sunflower oil only! Our snacks do not contain monosodium glutamate and are made with gmo-free raw materials. We produce Private Labels for customers as well. Everything is done according to client's needs- seasoning, packagings' weights etc. Made from corn flour. It means that they absorb much less fat and it is definitely a better choice compared to the current wheat and wheat-potato products available on the market (100g). 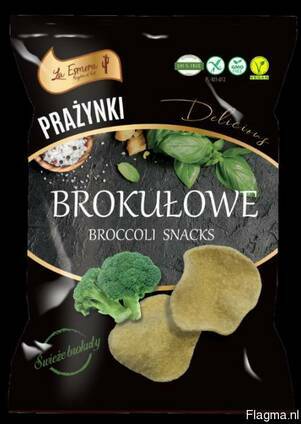 Absolute novelty- snacks with high fibre content and 34% fresh broccoli puree (100g). Snack in the shape of wavy oval with the taste of sour cream & chives (120g).